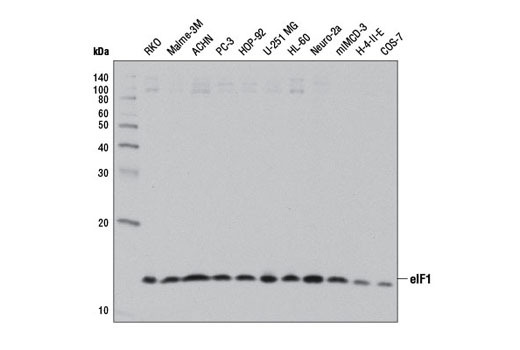 Western blot analysis of extracts from various cell lines using eIF1 (D7G3L) Rabbit mAb. 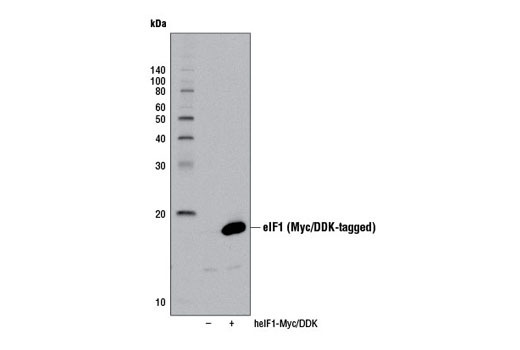 Western blot analysis of extracts from 293T cells, mock transfected (-) or transfected with a construct expressing Myc/DDK-tagged full-length human eIF1 (heIF1-Myc/DDK; +), using eIF1 (D7G3L) Rabbit mAb. Immunoprecipitation of eIF1 from 293T cell extracts, using Rabbit (DA1E) mAb IgG XP® Isotype Control #3900 (lane 2) or eIF1 (D7G3L) Rabbit mAb (lane 3). Lane 1 is 10% input. 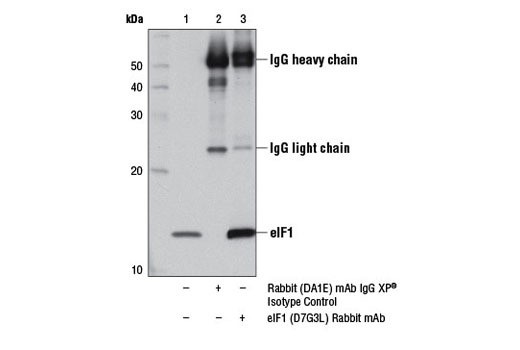 Western blot analysis was performed using eIF1 (D7G3L) Rabbit mAb. eIF1 (D7G3L) Rabbit mAb recognizes endogenous levels of total eIF1 protein. Based upon sequence alignment, this antibody may cross-react with eIF1B. Monoclonal antibody is produced by immunizing animals with a synthetic peptide corresponding to residues near the amino terminus of human eIF1 protein. Eukaryotic translation initiation factor 1 (eIF1) was first purified as a factor stimulating binding of Met-tRNA and mRNA to the ribosome (1,2). eIF1 is essential for growth in yeast and two classes of mutations in yeast eIF1 indicate a role for this protein in ensuring accurate translation initiation site selection (3). It has been demonstrated that eIF1 expression is stress-inducible, suggesting that modulation of translation initiation occurs during cellular stress (4). Schreier, M.H. et al. (1977) J Mol Biol 116, 727-53. Trachsel, H. et al. (1977) J Mol Biol 116, 755-67. Yoon, H.J. and Donahue, T.F. (1992) Mol Cell Biol 12, 248-60. Sheikh, M.S. et al. (1999) J Biol Chem 274, 16487-93.